Toilet brush and holder in white. Lockable, vandal resistant toilet roll holder. This Super Washroom Cleaner and Disinfectant is ideal for use in commercial and business properties, as well as homes. It formulated to cut through grease and grime easily and effectively. It comes in an easy to use spray bottle and is available to buy online and can be delivered straight to your door. Our value for money toilet rolls are specifically made to help them be strong but soft. The toilet tissue itself is a 2ply, 320 sheet roll. Each of the packs come with 36 rolls in them. Making them just £0.26 a roll and less than 0.08p a sheet. 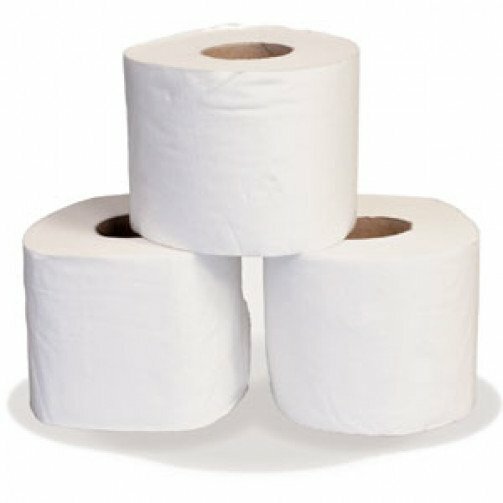 These toilet rolls are perfect for large businesses, schools, services etc. For that reason they’re available to purchase by the pallet, with each pallet containing 60 packs of 36, equalling 2160 rolls. Made to be both strong and soft. Value for money at only £0.26 per roll. Pallets are available, use product code: TR320C-5030. Q. I buy your toilet rolls from Booths in Windermere and have been recently dismayed to find they have discontinued them, the reason being that they now stock their own basic ones instead. Theirs are the usual tiny sheets; yours are the only ones I know which are soft, strong and with sheets which are a sensible size. I have protested to Booths most vociferously but in the meantime where can i get yours now? A. You can get them right here.